I quite like the version Burda made up for the magazine using a jacquard and bead trim, but since we are about to enter winter and are having some wild and windy weather I used a length of wool coating that I picked up in a op shop for $4 some years ago. The fabric has a wonderful feel to it, not at all scratchy but soft with enough body for a jacket, however it's all a bit too much pink for me to wear. A jacket for a young lady though is a perfect use for it. This pattern is really simple, as it has no closures, those pockets are fake and it's designed to have the edges bound in bias binding so there are no facings or linings. Because I used a wool fabric I chose to line it, using a pink lining also from an op shop purchase and a long time stash resident. I cut out the lining from the pattern pieces and lined the jacket to the edge. I changed the pattern slightly by adding length to the body of the jacket and the sleeves - it's a bit too cold for three quarter sleeves at the moment. I also added patch pockets to the front because everyone needs functional pockets, especially a six year old! The trim is not only the most expensive part of the jacket (the only component bought new and not from the stash) but was the most time consuming part because I hand sewed it to the neck edges and pockets. I found it really hard to pick out a trim, mainly because I'm terrible at picking out complementary trims but also because they all seemed a bit too grown up for a child's jacket. In the end the trim I used is mostly pink but it has some rainbow sparkle to it which Anna loves so that was a good choice. I used sized 120 for the body (technically Anna is closer to a size 128), but I think the body is overall a little large and particularly at the back there is quite a bit of volume although it seems pretty good around the shoulders. I'm not sure what happened at the hem line because it definitely seems to curve up from the front - probably sloppy drafting on my part when I was making the pattern! And overall the recipient is happy which is what counts and hopefully means that she will indeed wear it. Everyone who has sewn for a child knows that it is never guaranteed that something you make for them will actually be worn! Final thoughts - a simple pattern that is quick and easy to make with infinite variations with fabric and trim choices. A lovely French style jacket for the budding fashionista! This pattern was given to me by my sewing friend Sandra back in January and it's exactly what I love in a tailored jacket - a fitted silhouette with an interesting collar. Plus it is in size 4 - 12 so I thought I'd get it to fit across my narrow shoulders pretty well. Plenty of others have had success with this pattern and raved about the fit, so I just rashly jumped in and made it. I haven't made too many McCalls patterns so I'm not as familiar with their fit as I am with say a Burda pattern, so I should have made a muslin rather than just rely on a flat pattern measure check because there are a few things that haven't turned out too well and I need to muster up the energy to fix. Firstly, those sleeves! This pattern has the most ridiculous sleeves I've ever seen - they are super long and super wide, which is obvious from the line drawing. I figured I could narrow them after I had sewn them up, but that didn't quite work because the seam line runs from the shoulder seam down the centre of the arm instead of towards the back like a traditional two piece sleeve. Because of my forward shoulders it meant that seam was really obvious and didn't hang straight at all. So I dashed off to the Fabric Store to buy some more fabric and I cut a traditional two piece sleeve from another McCalls pattern. They still aren't great, I can see from the photo above that they are still a bit too baggy and I could take them in slightly more. There's also some wrinkling going on, partly because of the linen fabric (which can't be helped) but also partly because I'm not very good at altering the sleeve cap to match the forward shoulder adjustment I do to the armscye- more practice is needed there I think. The second issue I have is with the fit - it looks too big especially around the bust along the princess seam and possibly at the hip because the bottom juts out a bit. I cut a size 6 at the top, grading out to a size 10 at the bottom because I didn't want it to be too tight since it is a jacket meant to be worn over other clothes. But you can see from the photo above and the one below that I should take in a bit more along the princess seams. The back could also use a bit more of a sway back adjustment as well I think, to get rid of those wrinkles. And I also need to move that bottom button lower, but that's an easy fix compared to the rest. It's absolutely ginormous, but I think shawl collars are quite feminine and I love that pleat at the back of the neck which gives the collar shape around the front too. And to veer back to the critical again, I should have graded the collar seams better because they show through a bit too much for my liking. Some other notes: I left off the draped pockets because my fabric, a stretch linen bought from The Fabric Store in January during their sale, was way too stiff and the pocket didn't drape but rather just gaped open. I don't tend to use pockets in jackets so I left them off. I also left off the fabric rose from the collar as well because I thought it looked a bit silly, and because I have an extensive brooch collection that I prefer to wear than a rolled up bit of fabric. The fabric is what makes this skirt a little bit special - it is a textured polyester with raised hexagons that I bought also in January from Tessuti during their sale. It was a remnant, so this skirt cost me a grand total of $10.75, since I already had the lining in the stash and the zipper is recycled from another skirt. So overall, I really like this jacket but I do need to do more fitting work on those sleeves and princess seams. Of course had I made a muslin I would have discovered this before making the final version. I can recommend this pattern to anyone who has this pattern (since it's OOP) and wants a feminine jacket but really think about using some different sleeves! I probably won't make this jacket again because it's such a distinctive look, but it will make a great addition to my corporate wardrobe. Once again I'm posting my monthly Burda project late although I did actually finish sewing it in March so I squeaked it in. I had no excuses either since the issue arrived in my letter box in the first few days of March, but I did have to think hard about what to make (there wasn't that much that excited me in this issue), and I made a muslin as well so that's almost like making it twice. This is a petite sized pattern (Burda sizes 17-21) so I thought it would be wise to make a muslin just to make sure that the wide waist panel actually sat at my waistline and below my bustline. I graded from a size 17 for the bodice, and then out to a size 20 for the waist panel and skirt, so a muslin was needed to make sure I blended the sizes properly. I don't often make muslins, so here is photographic proof that sometimes I am sensible! You can see in the above photo that I did take out a bit of width at the waist and top of the skirt line, which is to be expected when I was trying to grade between 3 sizes. But the waistband hit the right spot on me, so lengthwise the bodice was fine. Speaking of the fabric, this is a lovely Liberty print in a mid weight cotton that has been in my stash for years. I'm not even sure where it came from but I think this is the perfect pattern to finally use it - I suffer from decision making paralysis when it comes to beautiful fabrics far too often. The red piping I used is slightly too bright to match the red in the fabric but I couldn't find a better match and I think it looks ok anyway. I have to share a back view for no reason other than to show off my matching of the piping at the centre back invisible zip - getting these to match up can be so frustrating sometimes but this time it just worked out so well. 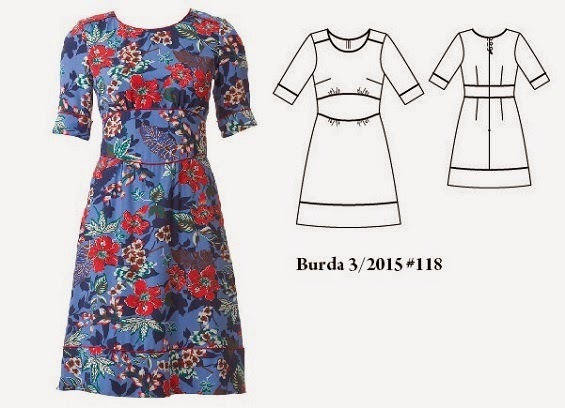 So it wouldn't be a Burda post without some complaint about the instructions,would it? So here goes: the instructions are extremely unclear about the hem bands on both the skirt and sleeves. In the magazine there is a short version (a lacey wedding dress for the 'confident bride') which is minus the hem band and this longer version which has the hem band, so you would naturally assume that the longer version merely has the hem band sewn on to the bottom of the skirt. But when I made the muslin I discovered that the skirt without the hem band was the perfect length. The pattern indicates a placement line marked for the piping but it doesn't say cutting line. The instructions aren't too clear either - it seems to suggest that you sew the piping in place along the marked placement line and then sew on the hem bands so that the hem bands are doubled layered. It was all very baffling but I'm glad I made a muslin so that I didn't waste any of my precious Liberty fabric. Anyway, long story short - if you are of normal height and plan to make this dress with the piping around the bottom make sure you check the skirt length! When I made my muslin I didn't make the sleeves, so it wasn't until after I had sewn the sleeves on that I realised that they were also too long to add the piping and hem band, so I've left it as is. Doesn't look too out of proportion to me, so I can live with it. Since I am human and not a perfectionist, I was a tad bit lazy and didn't line the dress or put the buttons and loops at the top of the zip at the centre back. I merely topstitched the piping down around the neckline and sleeves to stop the piping flipping out, and I made the invisible zip as usual (I did add a hook and eye to the top of the zip after taking this photograph though!). It looks messy inside but it's ok on the outside and that's all that counts to me. So overall I really like this pattern - it was well fitting for me without any major or unexpected fitting changes required apart from the length issue and is quite flattering I think for my pear shape with its a-line skirt shape and emphasis on the waistline. I'm thinking about making making this pattern in a solid colour for a work dress, because as much as I love this Liberty fabric it's a little too twee and sweet for my work wardrobe. Finally, check out this photo of Toby - he's recently had his third birthday and already he's more than half my height! I am definitely going to be the shortest person in my family in only a few short years I think. March just flew by in a blur of the mundane ordinariness of life, and writer's block of all things. I'm sure I've mentioned before that my day job is in environmental planning policy and legislation, and we have been very busy lately preparing a significant new piece of infrastructure legislation to be introduced very soon into parliament. And since I've recently started working a fourth day each week, it means most of my week is spent writing highly technical and legal documents, briefings etc so it's very hard to switch gears sometimes. Anyway I'm hoping this inconsequential blog post will break my block and I can get back to normal posting, because I have been sewing a little bit in the last month and have quite a few things that need to be photographed and posted, including my March Burda project which indeed was finished in the month of March. And so to brighten up this post, this month I'm sharing some pages from the 1961 winter fashion pattern catalogue from the Australian Home Journal. I've come to realise the mid 1960s may be my favourtie decade fashion wise - the period after the 1950s full silhouette had fallen away but before the mini skirts and hippie outfits of the late 1960s had taken hold - the suits with cute and feminine detailing and the tailored dresses in this catalogue are right up my alley. And I would love to have a house with an open rung staircase, indoor jungle and grasscloth wallpaper like the second photograph below!